Welcome to the all new Geek Pub Songs. I say "new" but in all honesty, it's the same as the old Pub Songs Podcast but with a shiny new title and a new format. I changed to the title to fit a new niche. Yes, this show features a lot of Celtic music. 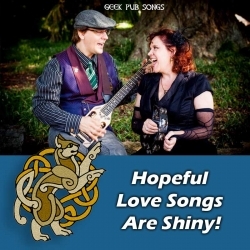 As I am the host of the Irish & Celtic Music Podcast, I get a lot of awesome Celtic music. So you can expect that. But I wanted a title that better fits my music as well. Most of my original music is Geek Pub Songs. So I decided to make that the new focus. In this show, you will hear Celtic music and Geek music mixed together. You'll also get a sneak peek at my new album of music inspired by Firefly. Yes, my album of Browncoat drinking songs called As Long As I'm Flyin' comes out on March 6, 2018. So I want to share that music with you. Now the first section of each show will be the theme of the show. No telling what will pop in during the second set. But for now, I have some hopeful love songs that share. This week in the pub, you'll enjoy music from Melanie Gruben, Serious Kitchen, The Elders, Jiggy, The Blibbering Humdingers, The Jackdaws,The Gatehouse Well, Dan the Bard, The Founding, and of course, Marc Gunn. 45:36 "Piper's Folly" by The Founding from Form. Thank you for listening. Geek Pub Songs was produced by Marc Gunn. If you enjoyed this episode, please support the musicians who support this podcast, buy their music, then share the show. Special thanks to all of my patrons in the Gunn Runners Club. Would you like 21 songs for Free? Plus get regular updates of what's new. Subscribe to the podcast and newsletter at www.pubsong.net. I want to send out a very special thanks to my generous patrons in the Gunn Runners Club on Patreon. These awesome people kindly support my music and allow me to keep this show running for nearly 13 years. Here's how it works. You pledge a buck a or more every month. And Your generosity allows me to keep creating. You get monthly music in this Geek Pub Songs Podcast, fun adventures in Celfather Music & Travel, Behinds the Scenes look at the life of a musician, and Stories from the Road. Plus, every month, I'll send you a free song, video, or concert recording. This is one helluva deal for as little as a buck a month Please support what you love. Join the Gunn Runners Club today! I want to thank my newest Gunn Runners: Dan, Erika Poole, Mike Mestemaker. Listen to the Top Irish & Celtic Music of the Week on Spotify. I first heard the song "Bean Phaidin" when I first took Gaelic lessons years ago. I love the melody, but I never really learned the lyrics. Now I feel like I've been missing out! Here's the lyrics. Last week, I posted an interview with my fellow hobbit musician, Samantha Gillogly, on the Celtfather Music & Travel podcast. You can find a link to that interview in the shownotes. Incidentally, Samantha has a new band called Revival that is now crowdfunding a new album on indiegogo. If you haven't heard yet, I am performing every Thursday in February at 11 am on my Facebook Live page. It's free show. I'll play about five songs on different themes. You can watch past ones there, or find individual song videos on my YouTube channel. I'm also playing this Friday, Feb 16 at Interstellar Ginger Beer & Exploration Co. in Alabaster, AL at 8 pm. I'm sharing Sci Fi Drinking Songs. If you can't make that, join me on Sunday, Feb 18th on Concert Window. I hope you will join me. March 6 is the official release of my Firefly CD. But in the meantime, you can get the Firefly Drinking Songs songbook as well as the Sci Fi Drinking Songs songbook in my merch store on Bandcamp. And since Valentine's Day just happened and you might be in the mood for love, I posted a beautiful Celtic Love sticker in the store as well. It is two cats beautifully bound together in a Celtic heart knotwork. It was designed by Ingrid Houwers. And best of all, you'll also be able to download my Celtic Love compilation, including two unique songs. The sticker is only $5.